This article will try to answer two questions: Why would you choose an industrial wireless mesh technology compared to choosing a commercial wireless mesh solution? Secondly, which industrial technology works best for your application? Industrial wireless and commercial wireless mesh technologies often use the same radio technology. For instance Zigbee, 6LoWPAN, WirelessHART, SmartMesh IP, and ISA100.11a use a 2.4GHz radio. This means we practically can use the same radio HW to run them all. Therefore there is not much gain in using industrial wireless mesh technologies over commercial solutions HW wise. This is where the industrial wireless mesh technologies can provide a better solution than the commercial solutions. What is wireless mesh compared to other wireless topologies? A star topology is similar to what you might find in a home network where every end node is connected to the centralized router. It’s main vulnerability is that if the router is disabled, then the whole network collapses. A cluster tree is similar to the star topology but with peripherals connected to the previous end devices (e.g. a DAQ (Data Acquisition) unit connected to a computer connected to the server). For the DAQ unit to be connected to the rest of the network, both the computer and the server needs to be operational. 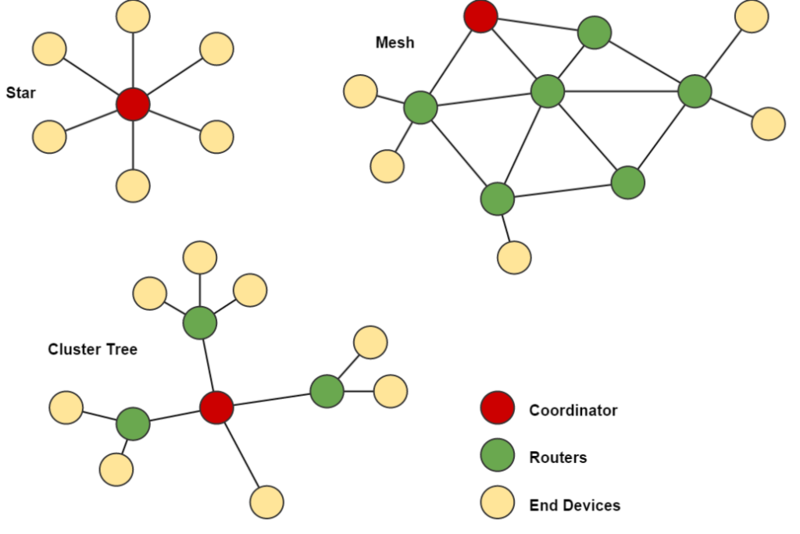 However, in the mesh topology every node can be both an end device or a router, meaning that each node has several links to the coordinator. This means that if one of the routers goes offline, most of the network is still intact by rerouting through the remaining routers. SmartMesh IP is the only one of these that is built for IP compatibility. However, they all provide resilience, reliability, scalability, security, and are made for low power applications. The use case that the comparison is based upon is 40 nodes in each network, measuring environmental data, and sending data every second. 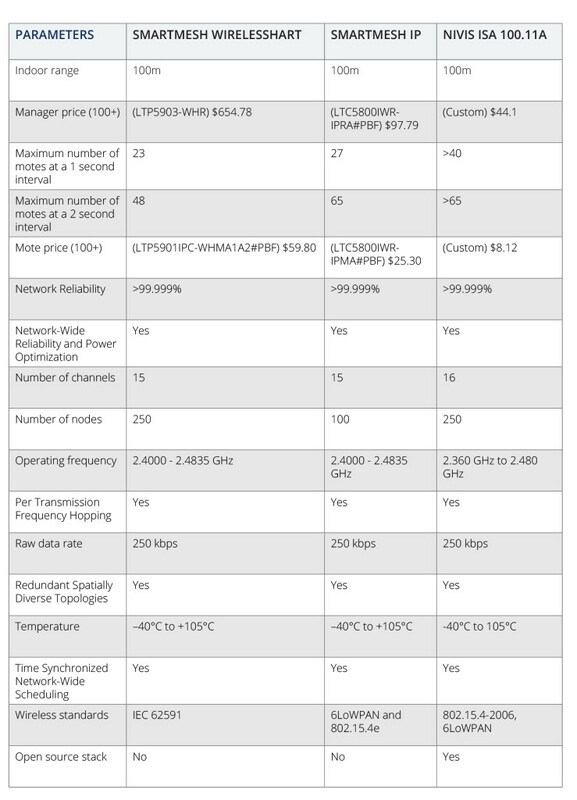 The compared technologies are SmartMesh WirelessHART node and manager modules, SmartMesh IP node and manager modules, and a custom HW designed by Data Respons with the Nivis ISA100.11a stack. For SmartMesh IP and SmartMesh WirelessHART, the cost is the cost of the modules, while for the custom ISA100.11a solution, the cost is a combination of development cost, stack license cost, radio certification cost, support cost, HW component cost, and PCB manufacture cost. According to CDS, the market share between WirelessHART and ISA100.11a is about 50% for each in average considering Asia, US, and Europe. In the Asian market ISA100.11a is in favor. In the US market ISA100.11a and WirelessHART is split approximately 50% for each. In the European market WirelessHART is in favor. SmartMesh IP is a fairly new protocol, so it has no considerable market share yet. 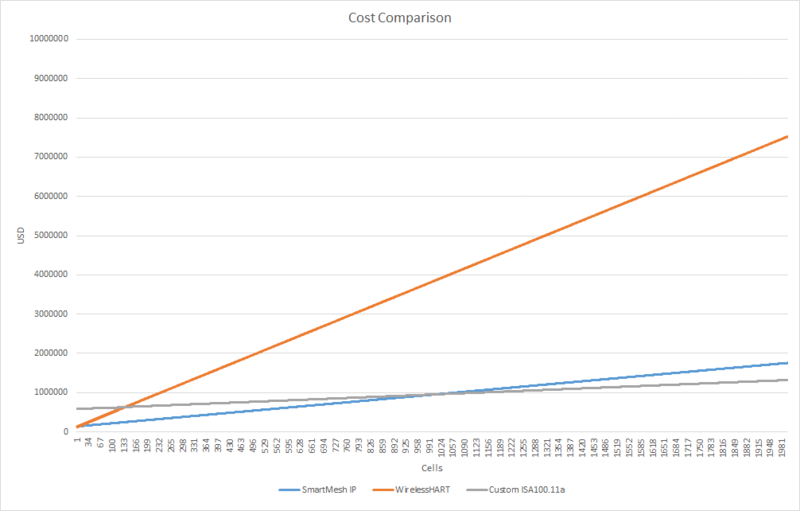 As shown in the cost graph in the paragraph above, the custom ISA100.11a is cheaper for high volume production given the low cost per mote. SmartMesh IP is a valid option up until about 1000 managers, but has its strength in keeping a low cost for the mid sized systems. The reason the SmartMesh IP is more expensive than the ISA100.11a for high volumes is due to the number of nodes supported, thus needing more managers. WirelessHART system is the most expensive but the most utilized mesh technology in Europe and the US. The conclusion is therefore that the choice of technology really depends on the scale of your system. If you are setting up a small system, WirelessHART might be the way to go since you get a well-tested and used system. If you are looking at a mid-sized system with up to 500 nodes, SmartMesh IP would be the logical choice. For larger systems you are better off choosing a custom ISA100.11a. This way you can keep the cost down and still have a large network of nodes. Note that this option requires more development cost than the other.